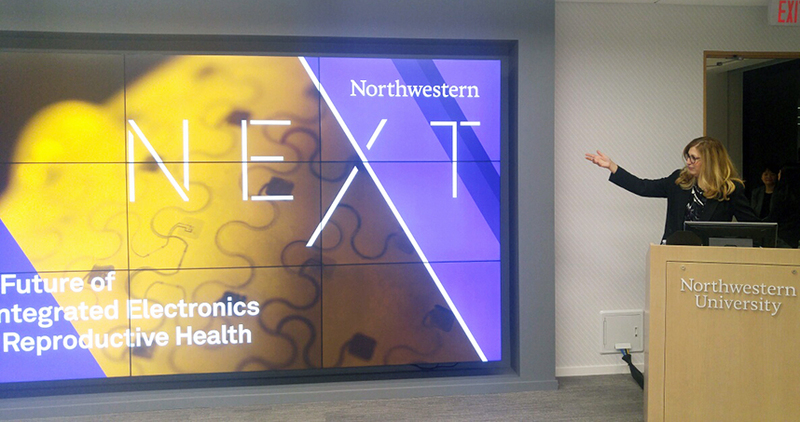 Ten Northwestern University startups showcased their innovative medical solutions last week at a Northwestern reception coinciding with a major healthcare conference in San Francisco. “The Future of Biointegrated Electronics and Reproductive Health” took place Tuesday, January 9. More than 150 people attended to learn about Northwestern’s innovative startups in therapeutics, diagnostics, and devices and listen to keynote addresses by Professors John Rogers and Teresa Woodruff. A pioneer in the development of biocompatible classes of electronic technologies, Rogers is the Louis Simpson and Kimberly Querrey Professor of Materials Science and Engineering, Biomedical Engineering, and Neurological Surgery. Woodruff is the dean and associate provost for graduate education in The Graduate School, Thomas J. Watkins Professor of Obstetrics and Gynecology in the Feinberg School of Medicine, and professor of molecular biosciences and biomedical engineering. She is an internationally recognized expert on reproductive health and coined the term “oncofertility” to describe a new field of medicine that offers fertility management options to women and men. Aptinyx: clinical-stage biopharmaceutical company that discovers and develops therapies for disorders that affect the brain and nervous system. Epicore Biosystems: develops soft, skin-mounted microfluidic devices that harvest and route sweat from skin pores to monitor human physiology and biochemistry. Exicure: clinical-stage biotechnology company that develops a new class of immunomodulatory and gene-regulating drugs to address inflammatory diseases, genetic disorders, and oncology. Innoblative: medical device company that is developing an intraoperative radiofrequency ablation device that uses bipolar current to intraoperatively create a controlled zone of ablation. Preora Healthcare: private medical device company focused on developing technology for the early detection and treatment of cancer through the study of cells at the nanoscale. Resonance Medical: artificial intelligence company that is developing a product called otoTune to fit patients with hearing aids without help from a human technician. Rhythm Therapeutics: clinical company that develops biological therapies to improve the treatment of atrial fibrillation. Synaural Inc.: company working to develop a user-friendly measure of auditory processing. Third Coast Therapeutics: drug development company that is developing orally active, small-molecule drugs that target and prevent the spread of cancer. Transplant Genomics: molecular diagnostics company that is commercializing a suite of tests enabling diagnosis and prediction of transplant recipients’ immune status to help optimize immune-suppressive therapies.